The pathogenesis of delayed puberty (DP) encompasses several conditions including functional hypogonadism, most commonly due to self-limited (also known as constitutional) DP, GnRH deficiency leading to hypogonadotropic hypogonadism, and disorders causing primary hypogonadism. Whilst many of the genetic defects responsible for the latter two groups have been identified in the last decade, the genetic basis of self-limited DP remains to a great degree an unsolved mystery. Self-limited DP is a highly heritable trait, which often segregates in an autosomal dominant pattern; however, its neuroendocrine pathophysiology and genetic regulation remain unclear. Some insights into the genetic mutations that lead to familial DP have come from sequencing genes known to cause GnRH deficiency, most recently via next-generation sequencing and others from large-scale genome-wide association studies in the general population. Results of these studies suggest that a variety of different pathogenic mechanisms affecting the release of the puberty ‘brake’ can lead to self-limited DP. These include abnormalities of GnRH neuronal development and function, GnRH receptor and LH/FSH abnormalities, metabolic and energy homeostasis derangements and transcriptional regulation of the HPG axis. Thus, genetic causes of DP may have effects as early as in foetal life, throughout early childhood, and on into adolescence. Zhu J, Chan YM. 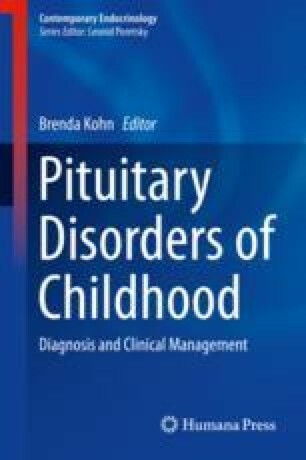 Adult consequences of self-limited delayed puberty. Pediatrics. 2017; https://doi.org/10.1542/peds.2016-3177. Howard SR, Guasti L, Ruiz-Babot G, Mancini A, David A, Storr HL, Metherell LA, Sternberg MJ, Cabrera CP, Warren HR, Barnes MR, Quinton R, de Roux N, Young J, Guiochon-Mantel A, Wehkalampi K, Andre V, Gothilf Y, Cariboni A, Dunkel L. IGSF10 mutations dysregulate gonadotropin-releasing hormone neuronal migration resulting in delayed puberty. EMBO Mol Med. 2016; https://doi.org/10.15252/emmm.201606250. Xu C, Messina A, Somm E, Miraoui H, Kinnunen T, Acierno J Jr, Niederlander NJ, Bouilly J, Dwyer AA, Sidis Y, Cassatella D, Sykiotis GP, Quinton R, De Geyter C, Dirlewanger M, Schwitzgebel V, Cole TR, Toogood AA, Kirk JM, Plummer L, Albrecht U, Crowley WF Jr, Mohammadi M, Tena-Sempere M, Prevot V, Pitteloud N. KLB, encoding beta-Klotho, is mutated in patients with congenital hypogonadotropic hypogonadism. EMBO Mol Med. 2017; https://doi.org/10.15252/emmm.201607376. Zhu J, Choa RE, Guo MH, Plummer L, Buck C, Palmert MR, Hirschhorn JN, Seminara SB, Chan YM. A shared genetic basis for self-limited delayed puberty and idiopathic hypogonadotropic hypogonadism. J Clin Endocrinol Metab. 2015; https://doi.org/10.1210/jc.2015-1080. Fukami M, Suzuki E, Izumi Y, Torii T, Narumi S, Igarashi M, Miyado M, Katsumi M, Fujisawa Y, Nakabayashi K, Hata K, Umezawa A, Matsubara Y, Yamauchi J, Ogata T. Paradoxical gain-of-function mutant of the G-protein-coupled receptor PROKR2 promotes early puberty. J Cell Mol Med. 2017; https://doi.org/10.1111/jcmm.13146.